When it comes to removing junk from the home, the job can be quite large. Many homeowners soon find themselves overwhelmed. If you are planning on removing items from the home – be it garbage, construction materials or recyclables; consider hiring a junk removal company. Kloos Hauling and Demolition are junk removal experts. We can handle the job with ease helping you to get rid of the items you no longer want or need. 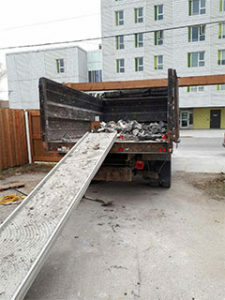 So, you might be wondering what kind of items our junk removal company can take when it comes to Winnipeg residential areas? Below is a short list of what you can expect us to help you remove from the home. Have you been collecting metal to take recycling but never got around to it? Perhaps you have inherited a property and the yard is filled with scrap metal? Whatever your situation or case may be, as a junk removal company, can help. Our team can remove scrap metal from the site and it is easily hauled away using our trucks or bins. Many homeowners often have recycling lying around the home, like empty soda cans or plastic bottles. Over time, these items can add up. You may not have time to take them to the appropriate area for recycling. In addition to the common recyclables, we can also haul away electronics, biodegradable waste, compost material or garden and yard refuse. 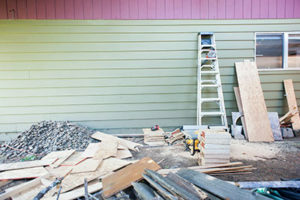 Worked on a project around the house and have construction debris lying around? Or, perhaps you have tree limbs and other debris in your yard from a recent storm. In any case, a junk removal company can provide removal services for the debris found in or around your home. The debris will no longer be an eyesore with the help from our team. If you have an overabundance of garbage on your property, a junk removal company, like Kloos Hauling and Demolition, can provide hauling services. It is not uncommon for a homeowner to have garbage in the home, be it from hoarding, years of accumulation, empty nesting, etc. Whatever the case may be, we are here to help you with whatever you need. Homeowners, business owners, healthcare facilities, and schools are just a few different types of our clientele that we help. From yard refuse and decluttering efforts to recycling and waste disposal – or if you’re not sure if we can help – make it a Kloos call 204-955-1188 – contact us as your junk removal company today! Posted in Blog and tagged Declutter, Junk Removal, Recycling.